Many gardeners are trying to attract more native insects, both in number and diversity into their landscapes in an effort to collectively patchwork a healthier ecosystem. There is an increased number of research projects focused on plant-insect interactions, trying to determine whether natives have a home field advantage over non-natives or cultivars of native plants. Several studies suggest that wild bees prefer to forage on the nectar and pollen from native plants...though not exclusively, while some studies have shown no preference one way or the other. Annie White, in her 2016 dissertation (The Univ. of Vermont), reported insect pollinators on the whole prefer to forage on native species over native cultivars. Because this preference was not true in all cases and also not exclusive suggests that some native cultivars may be equal to the native species. 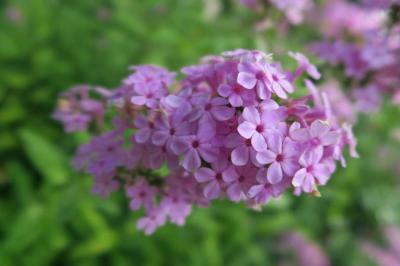 The Mt Cuba Center has an interesting report rating cultivars of our native Phlox paniculata. In it, they note P. paniculata 'Jeana' not only stood out for its mildew-free foliage, but found 'Jeana' attracted more butterflies than any other garden phlox in the entire trial. I checked to see how 'Jeana' performed against the native species, but was disappointed to learn the straight species did not survive. In a more recent HortTechnology article by Baisden et al. (2018), researchers found altering leaf color of native species from green to red, blue, or purple reduced insect use of a plant for growth and reproduction; concluding such native cultivars are not the best option when selecting plants to support insect-based food webs. No consistent pattern of use among the species and cultivars though were found for other traits such as variegation, fall color, habit, disease resistance, or fruit size; though the authors did suggest increased fruit size may present a problem to certain bird species. Additionally, there is concern native cultivars with reduced usefulness (i.e. red, blue or purple leaves) in terms of ecosystem health will potentially breed with native populations and hypothetically reduce the overall usefulness of the native species. The cat may already be out of the bag on that front, but the question still remains. The take home to all this is nature is complicated and insects follow no hard rules. Many native pollinators would not hesitate to feed from an open apple blossom, even though it is not native to North America. More research is needed to understanding insect preference across the whole spectrum of plants for us to have a better understanding of a healthy ecosystem. So far though, research tends to support an overall preference of insects for native species…at least based on the limited number of species and locations included in studies to date. Keeping that in mind, those who want to make their landscape more inviting to insects and other wildlife should at the very least attempt to increase plant diversity, with a focus on incorporating native plant species. View your landscape though another lens: one that includes retention of leaf litter for overwintering beneficials and feeding your soil; plants that provide food (insect-based food web), shelter, nesting and landing sites for birds; and plants that additionally support a diverse population of insects.